Sometimes you just have to go for the tried and true. Roasted asparagus has been a go-to for me since I started to “train myself” to become vegetarian and it quickly became a favorite. Easy to carry with you on an outing, munch on cold as an afternoon snack at work, or have ready as a side-dish to any dinner you prepare. One of the biggest myths I’ve come across in my transition is that you need a “well-balanced” meal — which, in the American mind, often means some starch, some meat, and some greens. 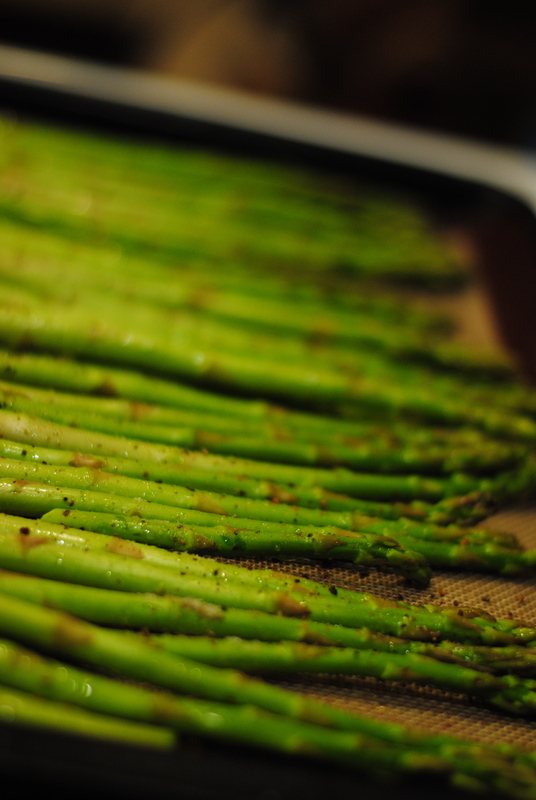 But asparagus, au natural, is delicious and sufficient by itself. In coming to vegetarianism, I knew that I would need to find a few staples that are quick, easy, filling, and delicious. These, and not the elaborate dishes, are what have sustained me in my journey to vegetarianism. Like most things I blog about, yes, this is also a metaphor for life. Not only are you simply what you eat, which is temporary and hard to maintain — you are also the habits you form. So here’s a recipe to help you form the habit. Eat and be happy. Preheat oven to 375 degrees. Then rinse your asparagus clean (preferably organic veggies so you can get some of your B-12! — as meat-eaters often say: vegetarians don’t get enough B-12. Why, though? Let me tell you — B-12 actually comes from the soil. Our vegetables, if they are organic, and not grown with pesticides and subject to excessive cleaning, contain everything we need). Break off the ends of the asparagus. 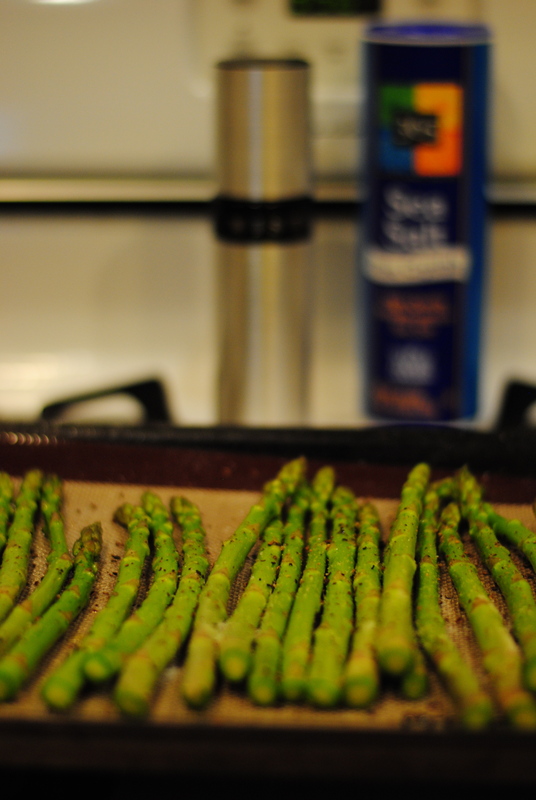 Set the asparagus on a cookie sheet with aluminum foil or parchment paper or a silicon baking sheet. Use a mister to thinly cover the asparagus with olive oil (using a mister helps to reduce the amount used). Sprinkle salt and ground pepper. Set in the oven for approximately 10 minutes at 375 degrees. Contain yourself until they cool, spritz with lemon juice, and ENJOY! I often eat my roasted asparagus straight from the cookie sheet. No need for rice or anything else at all! And you’ll probably get some of your missing B-12! It’s important to have go-to recipes, whatever they may be, something you know how to make or do, that when you’re busy, or you’re down, or it’s 104 degrees all weekend and you can’t be bothered to do much, you can just pop these in the oven. It’s also about having routines and setting paths. Because my food is so intertwined with my Judaism, I see clearly how having these things that “make it easy” sometimes are the very things that keep me going. Some days, frankly, I just don’t want to write a dvar Torah and I don’t want to investigate the history of asparagus and the Jews, but I know I want to eat something that makes me feel good and keeps me active. So if it’s just one of those weeks for you too, here you go!